I am a sailor traveling around the word with my sailing catamaran, and i wish to publish some video about my travel. I tried to create a template to use all the time with my video. 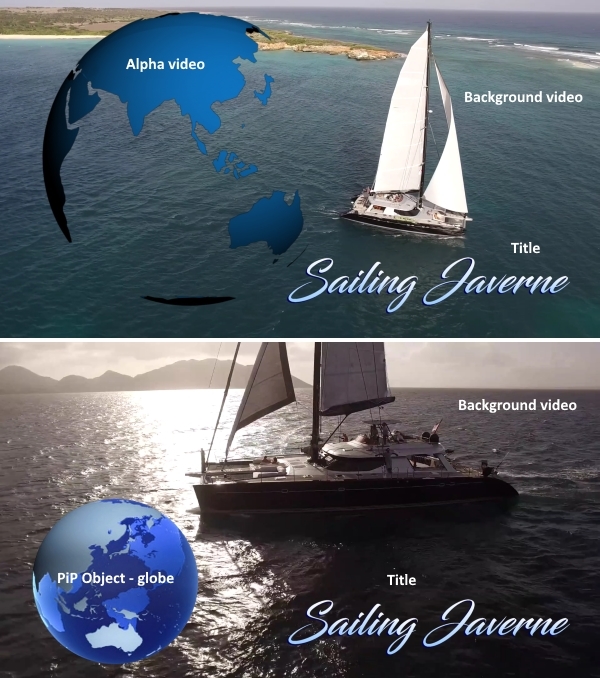 Any help to create a template with a world globe turning and a catamaran, and the name of my boat. Thanks in advance for your help, and sorry for my english, i am french speaking. Is it for an intro? If Godfrey is "seeing what he can come up with", I'm sure you'll end up with something wonderful! I doubt I'd mange to match Godfrey's creativity, but my first thought would be to build two mini projects (opening & closing sequences) that could be inserted into your videos. Something simple perhaps with some favourite footage, an alpha video/PiP object overlay & a title. thanks for your advice and your help. it look great, but is the boat mooving ? And the world globe turning ? and my question ? How to do this job ??? the result is close to what i woud like to have. That video is unlisted because I "borrowed" the background video content to illustrate a possibility. Screenshots of the PDR timeline for each sequence are attached. Each element is in its own track. The alpha video is one I purchased from a stock video site. The PiP object was obtained from a PDtoots giveaway. Mine is NOT better than PIX's, but I want to keep my promise. I created an Express Project for you. Just extract the ZIP and double-click the self-installation file. You will then nfind it under "Express Projects" in Powerdirector. Good Luck! Many many thanks for your help, and the time you spend for it. i will now put my elements inside. Many many thanks for your help, i have now too projects and i will spend time to fit the project to my nead. best regards ans thank you. Excellent work, Godfrey! What are wonderful asset you are to the CL/PDR community and, I'm sure, greatly appreciated by members. Javerne, I'm glad you were able to get a head start on your project. Quote Excellent work, Godfrey! What are wonderful asset you are to the CL/PDR community and, I'm sure, greatly appreciated by members. Thanks for sharing your thought. I think you are enjoying your travel. Hi I'm new on here just wondering if anyone know how to transfer templates to the cloud - is this included in the package? 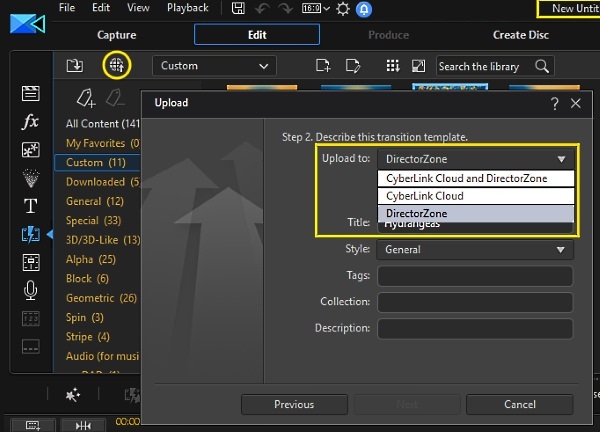 After you've created and saved a template, you have the option to upload it to DirectorZone, Cyberlink Cloud or both. Then you'll have a link for sharing your template with others. Here's the link to the transition template I just uploaded to CL Cloud. I have the Cyberlink Cloud but was not aware that you can share the files to the public. It looks like that yours is through Amazon rather than Cyberlink. This would mean that you could also set up the google or the one drive as the cybelink cloud, right?? Users can, indeed, share templates, projects & media uploaded to CL Cloud in much the same way as can be done with Google Drive, One Drive & others. The difference, of course, is that CL Cloud is accessed directly through the software being used. Please see the attached screenshots showing the ways to get a shareable link. As far as I'm aware, CyberLink Cloud is a separate entity & unrelated to any other cloud service. What makes you think that? It's not clear to me what you mean by the second part of your post. Thank you for posting the screenshots. I have never shared templates this way before. I always used the Directorzone or packed them using the PD Template maker by Godfrey. The screenshot attached here show Amazon is the supplier of your cloud service from Cyberlink. See the circled text. Gosh! I'll have to try to be more observant! You're correct. CL appears to be using Amazon Web Service.